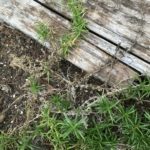 Black rot on creeping phlox is a major problem for greenhouse plants, but this destructive fungal disease can also afflict plants in the garden. Severely infected plants often die because the roots are unable to take up nutrients and water. Early identification and treatment are critical for managing the disease. Read on to learn what to do about creeping phlox with black rot. Creeping phlox with black rot may initially look like the plants lack fertilizer. When infections are mild, older leaves are often yellowish-green while younger leaves may take on a reddish tint. As the disease progresses, lower leaves curl downward. The roots of rotting creeping phlox plants display light brown spots and lesions develop on the stems. Eventually, roots shrivel and turn brown or black. Black rot is favored when the weather is moist temperatures are cool, between 55 and 61 F. (12-16 C.). The disease is less common when temps are 72 F. (22 C.) and above. Black rot on creeping phlox is spread in the soil and by rain or overhead sprinklers via waterborne spores. Excessive irrigation contributes to the problem. Plants grown in alkaline soil are also more susceptible to black rot. In greenhouses, fungal gnats are efficient at spreading the disease. Remove diseased plants or plant parts immediately to limit spread of the disease. Dispose of infected growth in sealed bags, or by burning. Avoid overwatering. Irrigating in the morning is best because the foliage has time to dry before temperatures drop in evening. Fertilize regularly, but don’t over-feed the plants. Lush new growth may be more susceptible to black rot disease. Thin plants as needed to avoid overcrowding. Maintain slightly acidic soil because black rot thrives in neutral or alkaline conditions. Test your soil first to determine how much adjustment is needed. Tests are available at most garden centers. Your local cooperative extension office can also advise you about soil pH. If you’re growing creeping phlox in a greenhouse, be sure to keep the growing area, and the entire greenhouse, as clean as possible. Fungicides may be effective when applied regularly, but only if applied when symptoms first appear. If weather conditions are conductive to black rot, consider treating with fungicide before symptoms show up.